I didn't get much sleep on Saturday night. We played the whole day in Cherry Hill and hit the sack early, but at about 10:30pm our tent suddenly lit up like Times Square. A multigenerational extended family had pulled into the site behind us and began assembling their camp, flashlights sweeping across our tent like searchlights. They were loud, spoke Spanish, and seemed to be all around us. We had no idea what was happening and before long Quimby implored me to go outside and see what the hell was going on. By the time I got my pants on, grabbed a flashlight and emerged from my tent, the site behind us already had about twelve tents, a general store, two restaurants and a saloon. To make matters worse, they had even erected a tent between our tent and the one the kids were sleeping in. I stood there, watching the action in disbelief at this gross breach of camping etiquette, but I lacked the energy and the language skills to intervene, so I simply shook my head and grabbed my computer and went off in search of an outlet to plug in my macbook to write the Cherry Hill blog entry. At least if I got hungry for a burrito, I knew where to go. The morning air was cool as we broke down our campsite the next morning, but the sky had an early September clarity that promised a mean heat by afternoon. After a quick stop for breakfast at Pig & a Jelly Jar in central Salt Lake, we hit the I-15 for the penultimate leg of Man vs Machine V. We started with the windows up, but as we pressed south, the windows inched lower as the sun rose and the mercury climbed toward 100. That's been the achilles heel of every Man vs Machine--at some point you have to cross the desert in a ride without air conditioning and it's brutal. I won't lie. Vinyl seat sweat is a form of torture that is specifically called out in the Geneva Convention. As if to register her discomfort, the old Pontiac began to growl in the early afternoon, soft at first, but it grew louder as the day dragged on. When we pulled off for fuel in St. George and slowed down for the first time in two hours, I began to worry. Not only was it turning into a howl, it was also making a scraping sound that could only be heard at slow speeds. We planned to stay overnight on Sunday in North Las Vegas at our friend Shauna's house, which was only about 100 miles away, so I figured we'd just limp it the rest of the way and I'd have a look when we got there. I suspected that my brake adjuster had come loose in the brake drum, which was unfortunate but not critical. When we got to Vegas, we unpacked and took a quick shower. Shauna had an amazing tri-tip on the grill already and before we knew it, we were several bottles of wine into the evening and my plan to pull the now-constantly-suspect left rear wheel would have to wait until morning. We got up around nine on Monday morning and I pulled the Pontiac out of her driveway and into the cul-de-sac to jack it up and remove the wheel to see what was going on. It was then that I noticed the puddle under the wheel and upon closer inspection, it was gear oil mixed with millions of tiny metallic flakes. I knew immediately I had a more serious problem. With the wheel removed, the entire brake drum was full of gear oil and when I tugged on the wheel hub, the entire axle was loose. The tire that had caused me so much trouble had done more damage than I had anticipated. For hundreds of miles, it had hammered on the axle bearings like a tomahawk, and the death blow had been delivered well before I had replaced the tire in Utah. The old girl was bleeding out, and she needed more help than I could render in a cul-de-sac in Las Vegas. She needed surgery. If I drove her home, I'd likely do real damage, and even though I could probably pull the axle and replace the bearing right there, I really needed to flush the differential case to remove all the metal. I also had a host of secondary problems--I had a flight to catch at 8:10pm, the I-15 had already backed up with Labor Day traffic and the temperature was again inching over the century mark. I slipped the brake drum back on the hub and bolted the wheel and took a moment to consider the import of my diagnosis. Man vs Machine V was over. It wasn't about winning--the old Pontiac had already won. It was now about something else. The victor was also the vanquished, and the least I could do to repay her for 16,000 heroic miles on Man vs Machine III through V was to carry her off the field of battle parade-style on the the back of a flatbed. To push her any further just wouldn't be right. So I did what the day before would have been unthinkable: I pulled out my AAA card, swallowed my pride, and for the first time ever... I called a tow truck. For years now I've paid for the premium towing package through AAA, and in my mind I had decided that the towing range was 300 miles. In fact, on every Man vs Machine, I've done an air-high-five every time I've crossed the 300 mile radius. Turns out, I was wrong. It's only 200 miles and since I was 278 miles from Pasadena, with the holiday weekend, the extra miles came in at $10 per mile. It stung, but it didn't change my mind. Conscious of the clock, Quimby and Shauna sped down to McCarran Airport and got us a rental car while I waited for the tow truck. He finally appeared at 1pm and after half an hour of old-car shop talk, he winched her on the trailer. Because I was paying by the mile, he was obligated to take the shortest route. We had no such restriction, so we pulled up Waze and tried to thread the needle to get me to the airport in time for my flight to San Francisco. It was one of the more insane drives I've ever taken, speeding down desolate desert roads that I barely knew existed, past a rolled-over SUV as a life-flight helicopter touched down, and into LA through Palmdale (of all places). We were sierra hotel all the way and made the airport at 7:30pm, just a few minutes before my flight boarded. The flatbed finally pulled in at 10:30pm and the driver was weary. He'd spent nine straight hours in jammed-up traffic on the I-15. If proof was needed, this was it--there was simply no way the wounded old Indian would have made it under her own power. Sometimes you have to know when to hold 'em, and know when to fold 'em. The Pontiac is safely back in the garage. She'll get some TLC before she rides again. iPhone 6. Quimby’s flight was due into Salt Lake City at 5pm and despite allowing what would normally have been more than enough time, I had to keep the needle under 65mph to avoid the most violent vibrations from my damaged rear tire. By the time she landed, we were still 30 miles out. It turned out that she had forgotten her swimming suit though, so while Quimby made a Target run, we closed the last few miles, slipped into Cherry Hill to quickly set up our tent, and then headed to meet her at Target. Seeing as it was Labor Day weekend and the end of swimming season, Target was all out of suits, so we spotted a Kohl’s across the parking lot and kept searching. They had some amazing mix-and-match trashy suits that were perfect for the RV park and Parker and I both voted for the hot coral strappy number. We overplayed our hand though with imitations of various lines from Talledega Nights—so much so that Samantha, who can usually be counted on to side with her road trip co-conspirators, instead cast a surprise “nay” vote. Quimby, sensing a set-up, instead picked the most conservative black number and weathered the groans and “awww-come on” taunts from Parker and me. “You’ll never see any of these people again in your life,” I implored. “Give the people what they want!” Alas, it was too late. She picked the "swim funeral" suit. On Saturday morning, while Quimby and the kids played miniature golf and waited for the water park to open, I headed into Orem, UT in search of a replacement tire. My first stop was the local Big O, arriving minutes after they opened at eight o’clock. I backed the big girl into the first spot I could fit into and strolled into the office, expecting that the story of our road trip and the sight of the Pontiac in front would inspire extraordinary ingenuity. It doesn’t always work, but more often than not the sight of a 58-year-old machine lends a sort of street-cred that puts people in the mood to go the extra mile to keep us under power. Unfortunately, as I reached the appropriate point in my pitch where I usually wave dramatically to the chromed-out car in the parking lot, it became apparent that in backing my 22 foot cruiser into the parking space, I had inadvertently knocked over a stack of tires which now lay strewn about the sidewalk. The guy behind the counter frowned and looked unimpressed. After a few clicks on the computer, he announced that there wasn’t a tire of my particular ancient specifications in the entire state of Utah. I’d be looking at Tuesday or Wednesday, best case. It was the equivalent of “good day to you sir.” Disheartened at the prospect of ending our road trip in central Utah or waiting until the middle of the week, I thanked them and headed back to my wounded ride to consider my next move, realizing that this was Utah, and everything is closed on Sunday. If I didn't find a tire soon, I'd be looking at sitting out the Labor Day weekend. Back in the car and looking at Google Maps, I headed to the only other major tire shop in town--Les Schwab. It was much roomier in the parking lot this time and before long, the intoxicating spell of old iron and vintage Detroit style had convinced the manager that extraordinary efforts were warranted. Soon I had a pair of cheap, disposable, 14” oddball tires mounted on the back with half the guys in the shop holding up iPhones with pictures of old cars and swapping stories. The tires were undersized, and the Pontiac looked a bit dorky without the wide whites, but at least I was back in business and a quick test drive confirmed that the ride was once again smooth. Not perfect, but good enough to get us home. With our transportation once again fit for the road, we spent the rest of the day Saturday riding water slides, playing in the lazy river and eating junk food. It was Parker’s day, and he got after it—a fitting reprise to our last visit to Cherry Hill on Man vs Machine III. The war of attrition that had marked Man vs Machine V was still anyone's guess with 700 miles to go, but at 2,500 miles in, Man had finally taken what appeared to be a commanding lead. The old Indian gets a new set of skins in Orem, UT. The offending tire was nearly worn through where it had separated and my guy Clayton predicted it was ready to come apart at any time. The rest of the tires were in varying states of decay as well, so we scrapped the second-worst tire as well and put the two remaining tires on the front and the new ones on the rear. iPhone 6s. We arrived in Jackson shortly after nine o'clock, just in time for dinner at our favorite taco joint--Hatch. I'd give it an A- on the food, but an A+ where it really matters: the margaritas. After spending the morning on my hands and knees and then driving through the rain, I deserved one (or two). They closed at ten, so we scarfed it down and then headed back to our hotel and pulled the blinds. As I settled into the bed with Parker, he threw his leg over me and twitched. That's the last thing I remember. We've been to Jackson enough times by now that we have a whole routine, so Tuesday was predictable--breakfast at Persephone, followed by a trip to the toy store to play their shooting gallery game, fudge at the candy store, then window shopping, followed by bowling. Quimby usually elects to join us in Jackson Hole but she left the option unexercised on this trip, so I booked us a reservation at our favorite restaurant (Local) to put a fine point on it and texted her the picture to rub it in. The drive into Yellowstone on Wednesday morning was easy but the east side of the park was conspicuously devoid of wildlife, so we puttered our way, eyes peeled for animals, with very few photos to show for our first of two days in the park. Pulling out of Grant Village though, I noticed that the old Pontiac was rocking oddly from side to side and it had developed a worrying vibration over 50mph. After we set up our tent, I layed hands on my machine like a fire and brimstone preacher and commanded her to speak of the demons that had taken over her body. I pulled the skirts off the rear wheels and in feeling the tires, I discovered a tumor had taken shape on the left rear tire--a worrying bulge that explained the rocking and vibration. The tire had separated. Man vs Machine V was turning into a war of attrition, and every part that hadn't yet been replaced or rebuilt was seemingly fair game. Monday afternoon, it turned out, was just the intermission in the battle. We enjoyed our day in the park on Thursday, exploring the entire south portion of the figure eight, including Old Faithful, and then followed the advice of the rangers and headed to Lamar Valley in search of the wildlife that had yet to make any meaningful appearance. As soon as we turned east towards Cody, we hit the mother lode. 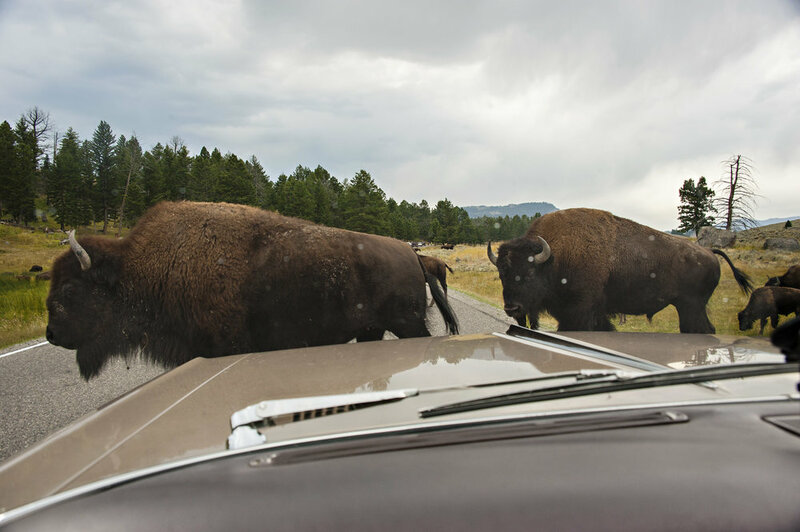 The cars were stopped dead in the road, as an entire herd of bison, had taken up residence on the yellow lines of the asphalt, daring each car to try to pass. They are impressive animals, but unpredictable and stupid, and wisely most drivers waited until they meandered to the shoulder before attempting to pass. We got some great shots of them walking right in front of the car, and notwithstanding Parker's desire to blow our horn at them, I declined. Man vs Machine V had been exciting enough already; I didn't need to be rammed by a buffalo as well. When the big game doesn't show, the landscape always delivers. Nikon D800, Nikkor 50mm lens, ISO 100, f 7.1, 1/60 sec. Yellowstone Falls, from Artist's Point. Nikon D800, Nikkor 24-120mm lens @ 85mm, f9, ISO 250, 1/320 sec. Elk in YNP. Nikon D800, Nikon 28-200mm lens @ 200mm, ISO 500, f 5.6, 1/125 sec. Bison have the right of way in YNP. Don't honk at them. Nikon D700, Nikon 28-200m lens @28mm, ISO 320, f9, 1/320 sec. After “The Ordeal” in Arches, we were more than grateful to be back on the road Monday and still in one piece. For as filthy a job as it was, it was a manageable parking lot repair and after a few test stops, I deemed the old girl road-worthy. We headed north at about 10am towards I-70 and then through Provo and finally into the mountains where US 89 weaves in and out of Idaho and Wyoming before cutting east for good. As we closed the last hundred miles, we drove into a full-on late-summer storm, complete with sky-filling lightning. It was the first real downpour I’ve had the pleasure of navigating in my land yacht and I discovered quickly that it handles more like a surfboard than a car. Taking no more chances, I kept it under 50 until we were through the worst of it. As we closed in on Jackson, the weather cleared into a glorious and moody evening, the kind you have to see to appreciate. Fortunately, my co-pilot shot some video, so come along with us! We woke up on Sunday morning feeling tired from the drive the day before, but we had to get going. We were only planning to be at the Grand Canyon for less than 24 hours, and as we broke down the tent and stuffed the sleeping bags back into their sacks, I realized that Man vs Machine V was going to be waaaay too aggressive. We only had a few hours to orient ourselves to the Grand Canyon before we were back in the old Pontiac and headed to Mesa Verde. We made the best of it though, walking along the South Rim, having breakfast at Angel Lodge, and perusing the gift shop (Parker got his first pocket knife--emblazoned on one side with a rendering of the Grand Canyon and on the other, the word "Dude"). It got a laugh out of me and that seemed to be enough to convince him that it was a winner. Still, I have many questions for whomever decided to order pocket knives personalized with the word "Dude", especially when not flanked by "The" and "Abides", but I digress. After some brief photos on the way out, we high tailed it to Mesa Verde National Park, arriving once again right before sundown. We pitched our tent and headed back into the town of Cortez, CO to grab some dinner. While we ate, I ruminated aloud about how long Monday's drive would be--over 600 miles from Mesa Verde to Jackson, WY--besting the record set on Man vs Machine IV by a full hundred miles. Samantha, who had been reading the itinerary in the car, piped up that perhaps we should cut our stay in Mesa Verde short and instead spend Sunday night in Moab, UT, shaving about 120 miles off the drive to Jackson. It was a great suggestion and we decided on the spot that we would call an audible. Our one night in Mesa Verde was uneventful, unlike the last time when we were nearly washed away. Before pulling out in the morning, I took another look at the level of my brake fluid. It appeared to be at the same level as it was in Kingman, so I was satisfied. We briefly toured the park before heading to Arches. NOTHING. I pumped the pedal and it went back to the floor. Zip. Zero. Zilch. With no warning, I suddenly had no brakes and we were heading down a mountain. I yelled at the kids to stop talking so I could think for a minute. I dropped the shifter into low while the engine growled and the speed dropped to about 30. Fortunately it was late and there weren't many cars on the road, but this was a park and people stop for all manner of rubbernecking. If anyone was in my way, it wasn't going to be pretty. I was now a 4000 lb runaway lead sled, and I was pointed downhill. On the bright side, I was glad I stayed up on Thursday night fixing the horns. When I saw the first turn off with nobody in it, I dropped the shifter into first and dived in while putting both feet on the pedal. Nothing. When I was just about out of real estate, I yanked the wheel back onto the road and considered my options while my stomach dropped away. The Pontiac continued downhill unimpeded. Seeing that plan B had now failed, Samantha decided that it was time to give me a pep talk about how she believed in me and that if anyone could figure this out, I could. I told her to shut it. There was another turnoff coming up again. I ducked into the turnoff and put one foot on the parking brake and one on the pedal and pushed for all I was worth. I got down to about 5mph or so before I ran out of pavement and jerked the wheel back onto the road. The parking brake was weak, but at least it had some stopping power. I just needed to time it better. The next empty turnout was on the other side of the road and I got on the parking brake early this time, crossing the centerline with both feet to the floor and one hand on the shifter, ready to throw it into park if I got close enough to a stop. We were slowing, but again we were using up too much runway. I pushed harder. We weren't going to make it. I pushed even harder. We were committed now--all that was left in front of us was tumbleweed. With a few feet to spare, I dropped it in park and it screeched and rocked to a stop, gasoline sloshing in the tank. I collected my shattered nerves and got out to inspect, while Samantha and Parker cackled about what a good story this was going to be. Samantha began texting her friends. As I stood there looking at the old car with new a new-found respect, I considered what had just happened. I knew I'd lost hydraulic pressure, but how? I lifted the hood and opened the master cylinder. It was empty. I retrieved the bottle of brake fluid I'd bought in Kingman and poured in enough to fill it up. I pumped the brakes a few times, feeling the pressure build, and crawled under to look for the tell-tale puddle. There wasn't one, but I saw that the left rear tire was wet. Leaking wheel cylinder. That's where the fluid went. The plug I tightened in Kingman was leaking for sure, but it masked a bigger leak. With the fluid filled and after a few test stops in the nearly-named Beck Memorial Turnout, I decided I could get it safely back to Moab, but no further without a repair. So this morning, behind the friendly O'Reilly Auto Parts store in Moab, Utah, I disassembled the wheel and brakes and rebuilt a wheel cylinder. A replacement part was unavailable. Took me two hours, but it got us back on the road. Helps to have your mechanic with you. This is not called Man vs Machine for nothing. iPhone 6s. The kids play on their iPads while I do the dirty deed in the parking lot. I think this is my version of extreme sports. iPhone 6s. Man vs Machine V rolled out of the driveway at 8 o'clock on Friday morning. I'd made a stink about wanting to leave at 6am and true to form, we missed the departure time by about two hours, but I'd built in a reserve, so we left more or less on time. Quimby was so anxious to see us leave that she was literally saying goodbye and opening the gate for us before we were even fully loaded. We headed east on the 210, up the I-15 through the Cajon Pass and then peeled off on I-40 and settled in for the long haul. Google Maps said the drive should take about 6 hours and 45 minutes to the Grand Canyon but I knew to expect that with the frequent stops for gas (the old Pontiac only gets about 15 mpg) and bathroom breaks, I should really assume more like 8 to 9. By 2pm when we pulled into Kingman, AZ for lunch, I figured we were on track for more like 10. We cruised down the main drag hunting for something we could all agree on and as I looked at the kitschy Route 66 shops and diners, it suddenly dawned on me that Kingman was the setting for the Disney movie "Cars". There was the water tower, the gas station that was the inspiration for "Flo's" and numerous other relics of a travel culture long gone. We were the real thing though, cruising through town low and slow, and after returning a few "thumbs ups" from the cars whizzing past us, we pulled into a curb service burger joint to complete the scene. As is my custom when driving a vintage car, I popped the hood after lunch for a look-see and was surprised to see oil all over the right side of the engine bay. After a wipe with my finger and a few sniffs, I determined that the oil was power steering fluid, which was my fault because I'd topped it off before we left and had inadvertently overfilled it, resulting in some leakage from the cap. In the course of my investigation though I discovered that my recently rebuilt master brake booster was leaking brake fluid out of a small plug under the master cylinder. Enough had seeped out the bottom that I was now dangerously low on brake fluid, so I dug my toolbox out of the bottom of the trunk and tightened it up and then headed back into town to find a NAPA Auto Parts to top it back off. With disaster averted, we got back on the road, and after a brief stop in Seligman, AZ to have a milkshake at the Snow Cap (one of the most celebrated roadside attractions on Route 66), we finally backed into our campsite just as the sun was going down. The kids helped me set up camp and then, after roasting hot dogs on the fire, we shoved nine candles into three cupcakes that we picked up at the camp store and sang happy birthday to Parker. They're both growing up too fast. © 2018 Brian Beck. All rights reserved.